Thinking about Cooper. Been gone almost three months now. Was with me for twelve years. Twelve years for the poor beast with an unstable leader. I got him from the humane society in Tacoma. His age estimated to be between one and two at the time. He never knew that he got older, although his body began to fail him near the end. That first day when I met Cooper I played with him for a while in a small room at the humane society. I was in there with him for quite some time…so I went out the door with him, then he peed on the floor so we went back in. We waited for the humane society human to come back. Then I confessed it was him that peed. Of course, I took him home. In the car, Cooper got into the back seat but quickly moved to the front. Then, while driving home on Pacific Avenue in Tacoma, he tried to get in my lap. Cooper wasn’t a lap sized dog, but he didn’t seem to know that. He got in my lap and the laps of others many times. He liked to curl up on the old yellow chair that curved around. 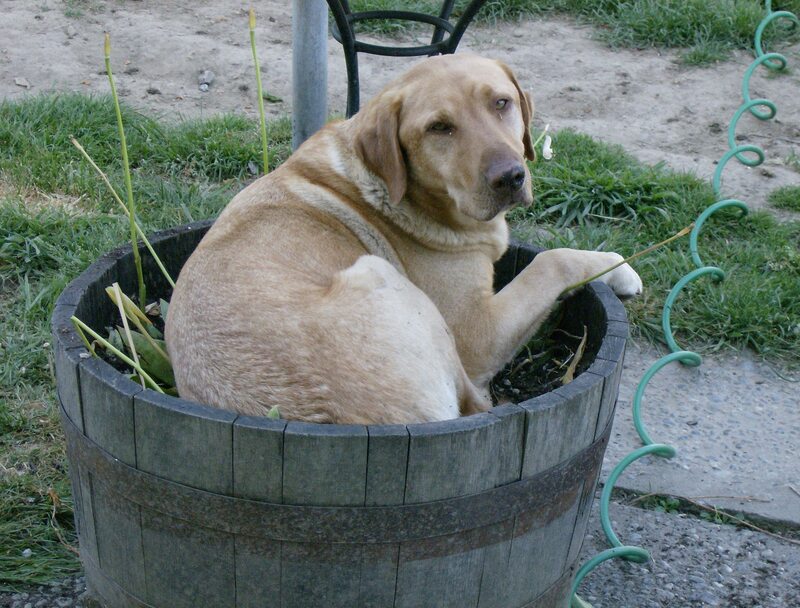 He once got into my whiskey barrel of plants, curling up and smashing them. I took a picture and it is still on my mother’s fridge. One time he got on a beach chair, did a few circles, and managed to lie down. 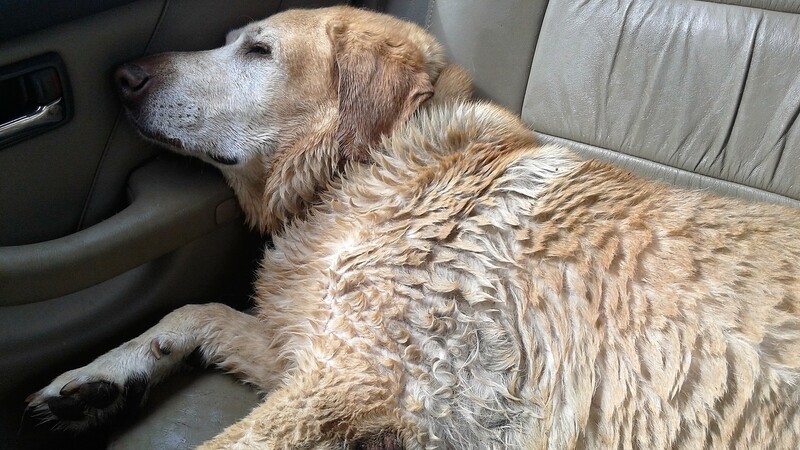 Cooper loved the water and sometimes the mud. I remember taking him to the dog park in the summer when I lived in Tacoma. He would run and run and run until he couldn’t run anymore. I knew when he was done because he wouldn’t give up the ball, he would just trot around with it. There was a concrete slab for the water bowl. 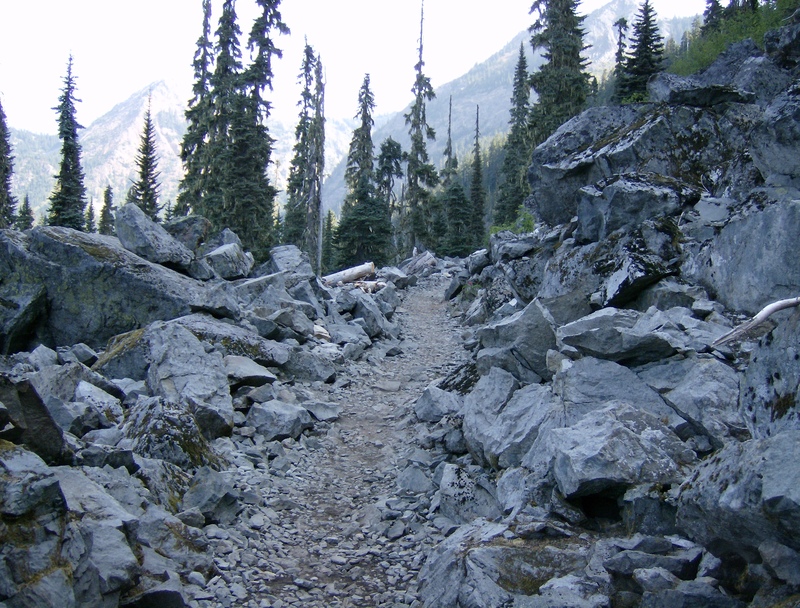 Surrounding this slab was usually muddy water. Cooper would lie down in this muddy water to cool off, looking delighted with himself. Walking with Cooper required much more effort than walking alone. Cooper easily walked twice as far as I did every time. This is due to his zig-zag-circle-around style of walking that seemed to be great fun for him but made me crazy and caused me to have more than one freak-out. I am not proud of my freak outs, but they did happen. 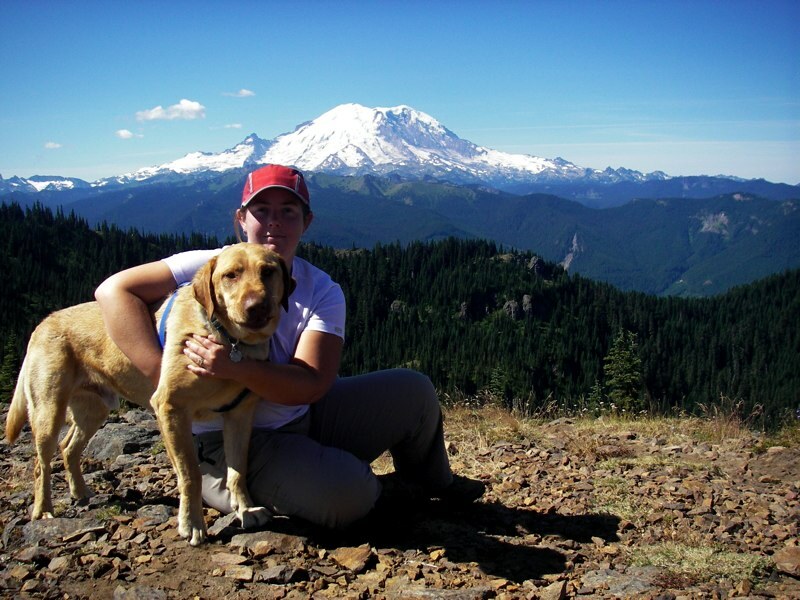 One time I was so irritated with the dogs walking back down the trail from the hike up to Kendall Peak that I dropped the leashes (more like threw the leashes down in a fit of rage) and went ahead. Of course, I didn’t just leave them, there was another human with me to pick them up. As I said at the beginning, I was an unstable leader. Taking Cooper to the water was great fun. The smell of the salt water would always make him start whining as we neared. 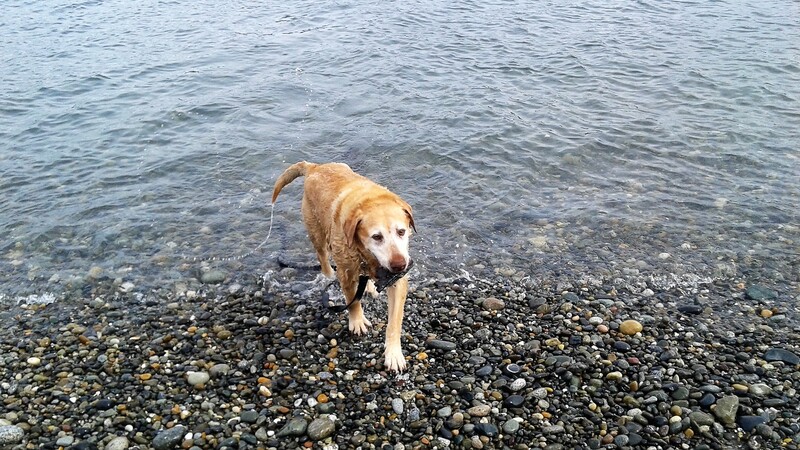 The hike to the water usually made me feel a bit crazy but once we made it to the water, Cooper’s excitement and delight erased my irritation. He would run around to find a stick and drop it at my feet. Sometimes he tried to get a stick that was actually a small tree still in the ground that slid down the cliff at Point Defiance in Tacoma. 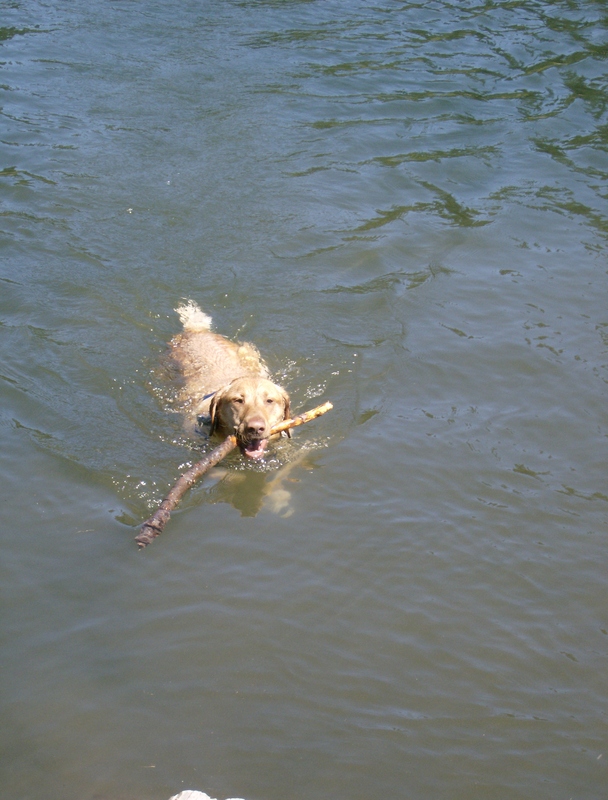 Cooper would swim for the stick and sometimes decide it was time to bury the stick. Cooper would dig in the sand with both front paws at once, so happy to be digging. He loved digging almost as much as he loved the water. 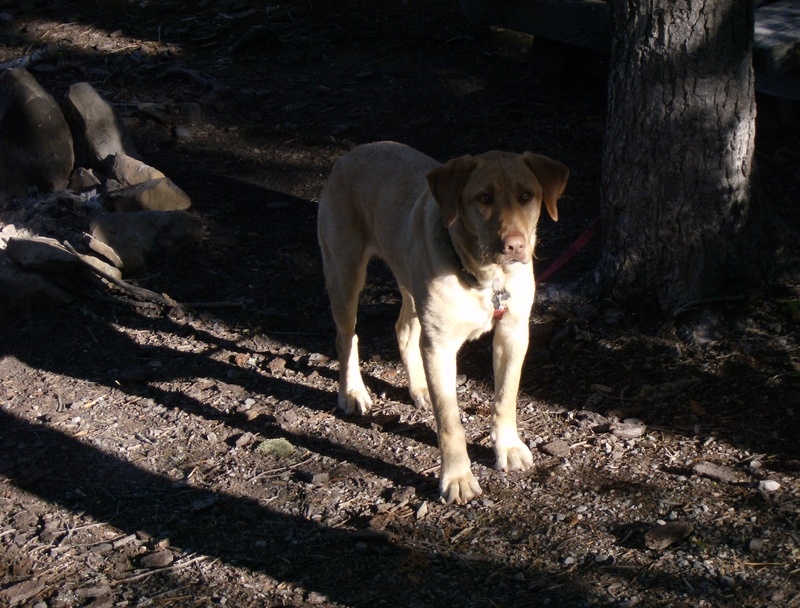 One time, looking out the kitchen window into the dog yard, I saw Cooper and our rat terrier, Spike, digging together. They were taking turns digging in the same hole. I didn’t holler at them to stop, I just watched their cooperative effort for a while. They were so happy to be digging. 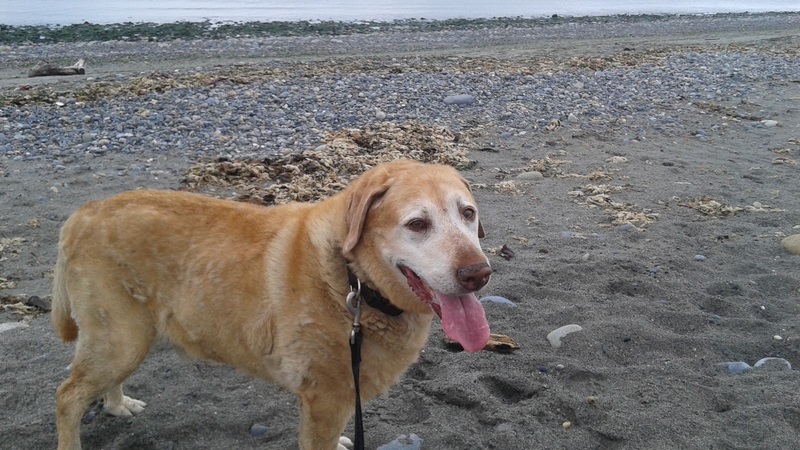 I took Cooper to the beach for the last time late in the summer on a cloudy day. It was a good day since the beach is less crowded on a cloudy day in the morning. He was excited to go somewhere in the car. He didn’t go places much the past few years because I had to lift his back legs in and try to stop him from leaping out and falling over. This day at the beach, it took him a while to remember he liked the water. When he did remember, he was very happy and he did find a stick. I didn’t throw the stick very far because I didn’t want to have to go in after him. I remember thinking at the time, that it was probably his last trip to the beach. There were fighter planes circling, a few other beach walkers with kids and dogs and lots of birds. Cooper slept in the same position all the way home. He was exhausted. There was a time in the late summer that I actually thought he was dying and I sat down on the ground with him. It turns out that he was probably drunk from eating too many fallen pears. It was a stroke that happened to Cooper in early October. It was a day I happened to have off work and the day he happened to have his routine geriatric dog visit scheduled at the vet. I managed to get him to walk down the ramp to the car but I had to get help to get him in. He managed to stand up on the ride in, he was happy to be in the car. Once at the vet I had them get a stretcher to take him in. In talking to the vet about his condition she said there was a chance he could recover. So, I took him back home, and gave him a chance. He didn’t recover. He got a worse instead of better. But, he was still happy to sniff me and lick me and eat and drink. He couldn’t stand up or walk or control his bladder or stop his eyes from wiggling or keep his head from veering off to the left. I sat on the floor with him in the dog room for an hour or so. We shared a beer and went back to the vet in the afternoon. They placed blanket on the table so it would be warm and soft under the stretcher. They gave me a whole bag of treats to give him. He was happy eating some treats and licking my face until it was time to go. I felt his heart stop. 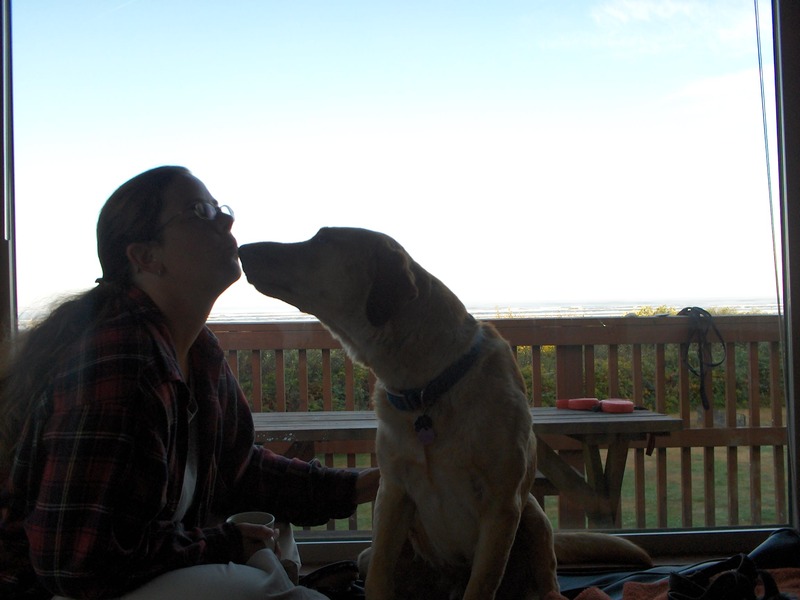 This animal was with me for twelve years. We rode all over the place together. He went camping up and down the west coast. 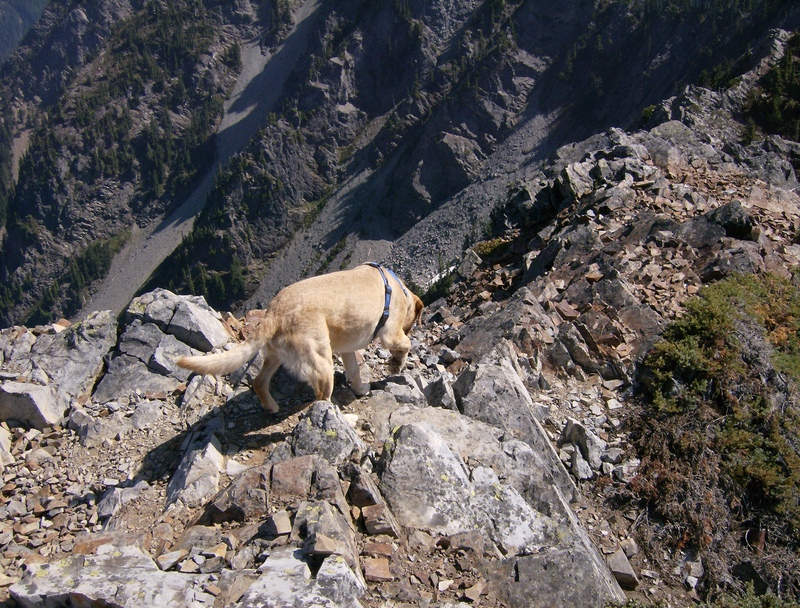 He went to the top of several peaks in the Cascade Mountains. He slept with me during the year I spent alone. He went to the blessing of the animals during that year. The priest blessed him and told me that this dog would help bring me patience. Patience and more over the years. He has joined the animals that left before him. I like to think they welcomed him. I like to think he will also be there to welcome me. This entry was posted in animals, waxing philosophical and tagged animals, blessing, death, dogs, hiking, hope, life after death, love of animals. Bookmark the permalink.